BT Games started as a single store in Northgate shopping centre, Johannesburg and have been around for a number of years. They now have nearly 50 stores throughout SA and are continuously expanding. They are incredibly passionate about gaming and have opened their specialist store in order to meet the needs of gamers. They also only employ gaming fanatics who are vastly experienced with regards to gaming, gaming accessories, all game related products and information. 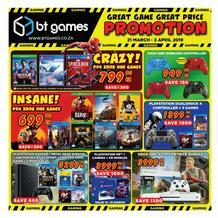 BT Games is one of South Africa’s leading gaming retail outlet and offer games, hardware, consoles, accessories as well as a vast range of other related merchandise. They also provide online games downloads, door to door delivery, collection from post offices or in-store collections. BT games also allows customers to digitally download games directly to their PC. BT games offers a loyalty facility. If you join their Advantage program all you need to do is bring the card in store every time you purchase something and you will then qualify for great discounts on new releases, pre-played games and other benefits. BT games even allows their customers to trade in their old games and offers them credits towards next purchases. 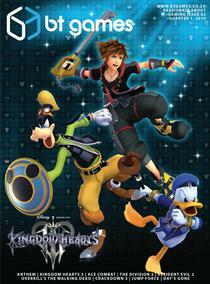 A range of hardware such as PlayStation consoles, Nintendo consoles, Xbox consoles and a variety of others. At Guzzle we endeavor to showcase the best deals and specials near you. BT Games is indeed one of our lead Gaming retailers so browse their catalogues or view great gaming specials available at their stores now. Address: Shop 50b Walmer Park Shopping Centre, Main Road, Walmer.